$107.99 plus free ground shipping anywhere in the US. 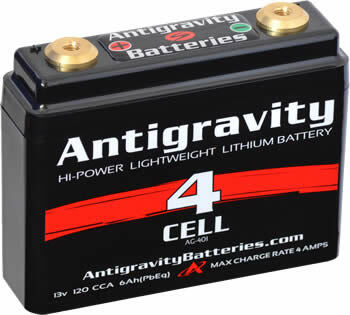 This is the smallest battery in the Antigravity Batteries line up. This battery offers extreme power in the most compact size in lithium motorsport batteries. Can start inline 4 - Cylinder motors up to 600cc for race use, or up to 250cc for everyday street use. Also a favorite of custom builders who want the smallest battery to tuck out of the way. Capable of every day use in bikes up to 250cc. Race use for Enduro and MX electric start bikes up to 450cc. (If you have a 250cc 2-stroke you will need to use the Antigravity Batteries AG801). Race and Track Day use in inline 4 cylinder 600cc sport bikes. (Honda CBR600 rider should use the Antigravity Batteries AG801). Custom builds or small bore customs up to 350cc.